If you are a Spotify user, you can follow this link to start listening to his playlist. He will quiet you... with loud singing! Any other reason to sing? God Sings! A good friend of mine encouraged me to choose a few Christian songs to regularly sing with our daughter Delilah at bedtime. Initially I thought, “oh great, I'll add it to the ‘how to be the perfect parent’ task list which already tallies around 100 things to ‘spend-a-quarter-of-an-hour-with-your-child-doing’ between getting home from work and bedtime.” However, I was persuaded to try it and did give it a go. It doesn’t happen every night, and it doesn’t always go to plan (i.e. she’s wide awake tonight, well after we've finished singing several songs!) but sometimes, just sometimes, she falls asleep and I finish singing over her and then quietly leave her to snooze away. ﻿Our God sings to us! He rejoices over us, His children. He demonstrates His love with loud singing. I think it's an incredible audio-visual image, and if ever there was a reason to sing, surely this is it: our God sings! ﻿This is an album you could buy for anyone you know or have playing when you have friends and family round this Christmas. It’s fun, it’s nostalgic, but at it’s heart it celebrates God’s plan for us in Jesus, which is the reason for the season, right? As the title suggests, this album is about the ‘Good News’ or ‘Gospel’ presented in a folk-roots style. The tone of the album is joy and hope in Jesus. Like all the Rend Collective albums it’s low-fi, not in terms of quality (which is excellent) but in everything they do they manage to keep their close-knit, campfire sound - as if you are right in there with the band. Expect lots of banjo, fiddle, singing, stomping, shouting and general raucous joy. I think the song “Resurrection Day” epitomises the album, the joy of salvation today, and the sure hope of the life to come in Jesus. ﻿These are the first words sung on the album, lifted from Psalm 51 and used in Anglican Liturgy as an invitation to worship. This sets the theme for this album of ten songs based on the Book of Common Prayer (clue in the title again). These are simple, short songs with interesting melodies and harmonies; it has an acoustic feel but there are synths and electric organ on this record as well. This album certainly was a grower for me and was my wildcard choice for this recommendation. Whatever your opinion on liturgy, for me, this setting helped me see the words anew and gave me a new love for the great Bible based summaries of the gospel. I hope it will for you too, and maybe you could think of someone who might appreciate this as well. Sovereign Grace is a large organisation of churches in the US who produce a lot of good quality Christian music and some great resources for church music leaders. We have been using their songs and resources at CCW for years, so when I heard they were putting on a worship conference in the UK I thought it would be worth a trip to Bristol to see what we could learn from them. The day I attended was pretty full on (9am-9pm!) It covered a lot of topics such as planning services, arranging music and the centrality of God’s word, and we spent plenty of time of singing and praising God together. 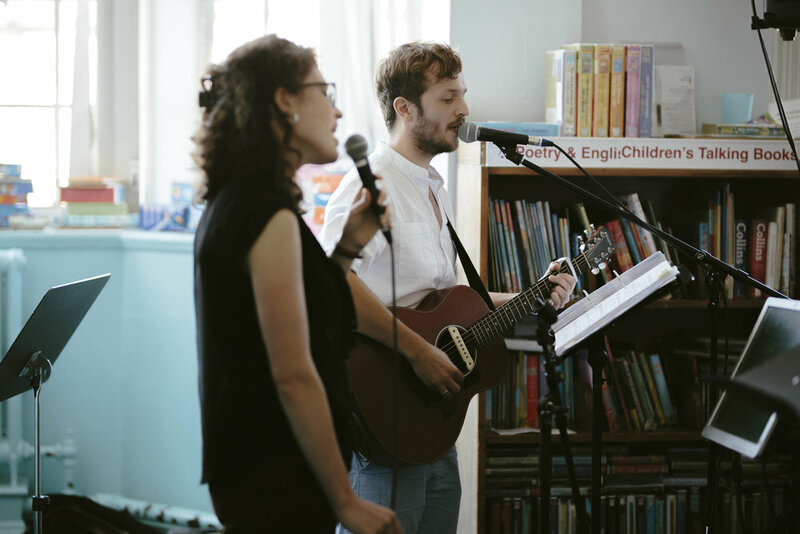 It was massively encouraging: the musicianship was excellent and the band lead us well so that the priority of God’s words was really obvious when we were singing together. It’s a bit of a weird one, telling us we are like living stones, especially strange when I was in a room full of people with whom, apart from the music leader connection, I had very little else in common. Some were a lot older, from other countries, speaking different languages, representing various religious denominations and all sorts of different professions and careers. But that was kind of the point, we were a bunch of odd, funny shaped stones, that on the face of it didn’t fit together, but when we came together before God’s word, to sing, pray and worship our creator God, we were being built into God’s house in order to “proclaim the excellencies of Him who called you” as Peter put in his letter just a few verses later. A house can’t be built with just one stone and we cant come to God and just be on our own. In a wall, each stone depends on the others to hold it up, and in God’s house, each stone is hewn and shaped with intention to look its best when it is placed alongside and connected with others. What’s more, Peter tells us that Christ is the cornerstone, not just part of this building - he sets the dimensions, shape and layout of the whole thing! So we are not just a pile of stones, we are sculpted stones built together into something that is much greater than it’s constituent parts. It means that sometimes, when we feel like we have very little in common with others in our church - different professions, personalities (and musical preferences!) - we shouldn’t be surprised. The reality is we are all odd shaped stones. But we are living stones, being built into a spiritual house, God's house, where He dwells and where we have one joy to proclaim the excellencies of our God. How incredible is it, that as we meet in worship this Sunday, together we are a hand-crafted, architectural masterpiece, a stunning edifice being built for God’s glory! Why do we worship? God reveals himself, so we respond. Have you ever met your idol? I'm not talking about someone or something you hold in higher esteem than God (though if that is what sprang to mind then there are some previous blog posts on the 10 Commandments that you should read!) but have you ever met someone you truly admire? How did the conversation go? When I was a teenager I remember unexpectedly meeting Steve. He introduced himself and then mentioned he was in The Stands, one of my favourite bands at the time. I was awestruck, and after I pulled myself together I started to tell him how much I loved his album, especially one particular song. Thankfully he graciously humoured me. Steve had revealed a part of who he was, something I was in awe of, and I responded, maybe a little over the top. I'm sure you can think of similar experiences, though I imagine you probably composed yourself better than me! ﻿God stated who He is and Moses worshipped. Moses knew who to worship as he had just been given a mini CV, a LinkedIn profile: God the merciful, gracious, patient, loving, faithful and just. We have a much more complete CV to draw on in our worship, as in the Bible we have the full revelation of God in Jesus.